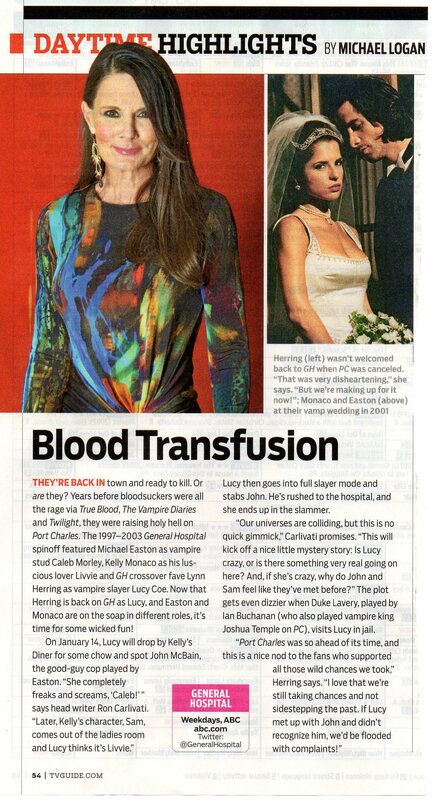 Out of the closet at last: my vampire soap novel! True confessions time: my novel-in-progress is paranormal fan fiction, inspired by the ABC soap operas General Hospital, Port Charles and One Life to Live. Since I began it last spring, I’ve been keeping the subject a deep dark secret, because I was convinced it was so brilliant someone would steal it. Well now, somebody has – and the culprit is ABC. Unbeknownst to me, the creators of General Hospital were thinking along similar lines. 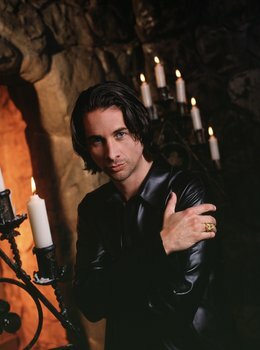 Michael Easton, who plays Lieutenant John McBain on GH, played the vampire Caleb Morley on Port Charles, a GH spinoff that was cancelled a decade ago. Kelly Monaco, the Dancing with the Stars finalist who plays Sam Morgan on GH, was Livvie, Caleb’s love and eventually his wife on Port Charles, which happens to be the name of the fictional New York town on General Hospital. What if Caleb Morley were somehow to return and take over the character of John McBain? And what if John and Sam, who already have great chemistry together, were to have a strong feeling of deja-vu? How would things play out? the past couple of weeks, ever since Lucy Coe, a Port Charles alumna played by Lynn Herring, came back to town, took one look at John McBain and swore he was Caleb Morley. She tried driving a wooden stake through his heart but only managed to wound him in the shoulder, and he’s making a good recovery. Meanwhile, everyone thinks Lucy’s gone crazy, and they’re playing the story for laughs. How will the new vampire plot line evolve? If head writer Ron Carlivati knows, he’s not telling, but the online fan sites are abuzz with gossip, and the Caleb/John- Livvie/Sam connection was even featured in TV Guide. Probably the fate of these characters depends to a great extent on fan feedback, which as of this writing seems to be running against the vampire theme. I was devastated when I first learned of this new plot line. How dare ABC steal my paranormal thunder? Was my novel dead in the water? Should I give up and scrap it entirely? I succumbed to gloom and doom for a day or so, then realized this turn of events could actually work to my advantage. The show’s ratings would probably go up, and the thousands of people who wouldn’t have cared about a long-defunct soap opera could well become my future readers. No matter how the paranormal story line plays out on General Hospital, mine will be totally different – and, I hope, funnier and more outrageous. I’m still not giving away any details, but I’d damn well better finish the thing and get it up on Kindle before the end of February Sweeps. Stay tuned for future episodes in my race against time. I welcome your comments, and I hope you’ll subscribe if you haven’t already. A special shout-out to the PC and GH fans I’ve been connecting with lately – your enthusiasm helps keep me going! 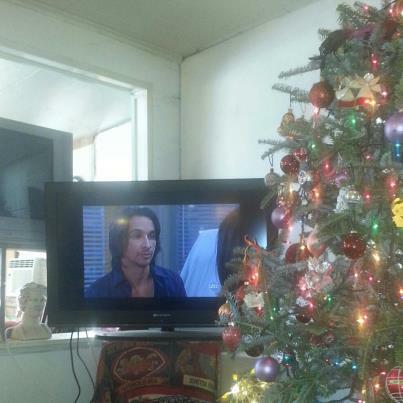 Michael Easton on General Hospital today. Yes, my tree is still up, but I’ve promised my husband I’ll take it down tomorrow. I did it! I made my first appearance on national TV, although I could identify myself only as a miniature blur of orange at the far right of the screen on Katie Couric’s show Tuesday afternoon. The taping took place Monday afternoon, and the show featured Captain Sully Sullenberger, who flawlessly landed a jet on the Hudson River on January 15th four years ago. Since my novel-in-progress is set in the world of daytime television, I wanted to get inside the studio of a major TV network, and I achieved my goal, soaking up atmosphere as best I could while being herded around with several dozen women. The ABC studio, on a primarily residential side street on the upper west side, was unprepossessing both outside and in until we were ushered onto Katie’s elegantly spacious set and slotted into our seats. The lengthy email guidelines advised us to show up at 1:30pm for a 3pm taping, saying we’d be admitted on a first-come-first-serve basis. To be on the safe side, I showed up at 12:15. A dozen women were already ahead of me, but when I was checked in and given a ticket emblazoned with the lucky number 13, I was sure I had it made. Once inside, we waited in a grubby beige visitors’ area for over an hour till they began ushering us to the set. But to my dismay, they called only the first ten people, then called those with tickets highlighted in pink, followed by those with blue and yellow swashes. Finally only a couple of dozen of us were left, and I began feeling paranoid, fearing I’d be blackballed. Why was I one of the few without a colored swash? Was I too old? Not attractive enough? 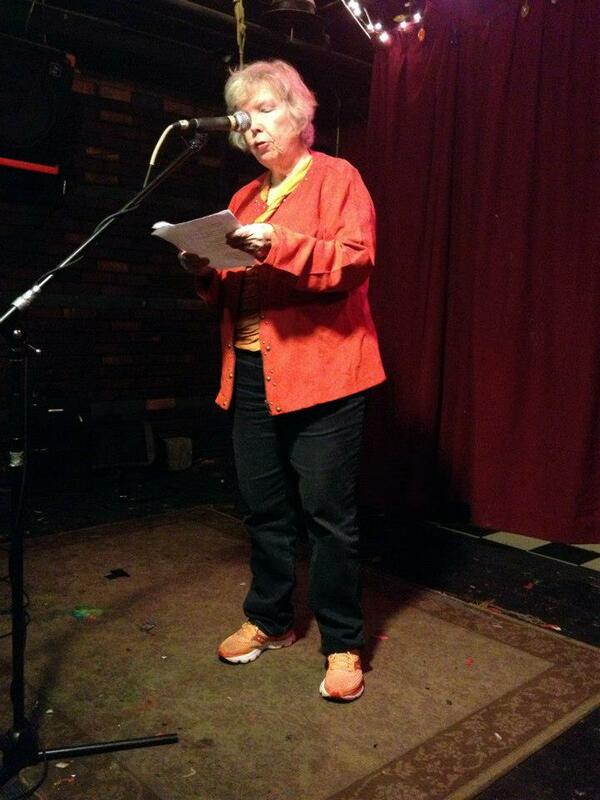 I knew I was “dressed to impress,” as they’d requested, in two shades of brilliant orange, while many women had flouted the dress code by wearing black or, heaven forbid, prints. I never did find out what those color codes signified, but I expect they identified specific “interest groups,” like friends and family of the survivors of Sully’s miraculous flight. At last I was admitted, and I was glad I’d had the foresight to show up early. By then nearly all the seats were filled, and since I was a single, they found me a seat in the third row, far right, where I was unlikely to be picked up in most of the crowd shots. A young comedian coached the audience on how to applaud (loudly and enthusiastically) and when we could take pictures (before and after). He told us to look alert and interested, to laugh and emote as appropriate, and not to space out and start counting the lights in the ceiling or picking our noses. Then Katie made her entrance, and we were on. Each segment was shot in real time, with no retakes. During breaks, the crew rearranged the set with crisp efficiency, and then an assistant gave us the countdown to applaud as she launched into the next segment. Katie was warm and engaging, Sully was the quintessentially modest hero, and the show whizzed by. 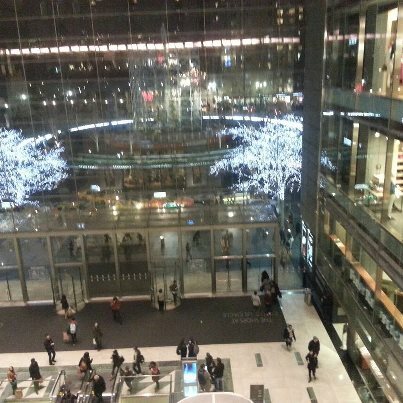 Back on the street a bit after five, I strolled downtown, past Lincoln Center to Columbus Circle, where I happened upon a snazzy new mall, several stories high, adjacent to Donald Trump’s towering International Hotel. On the third floor I found a restaurant with a wonderfully glittering cityscape beyond its wall of windows, and treated myself to a glorified version of pork and beans and a glass of Pinot Grigio. Like my other day trips to the city where I spent the better part of my youth, this one was pricier than expected, but I figure it’s tax deductible as research for my writing. Was it worth it? Well, I soaked in some atmosphere, picked up some details I can use in my novel. I grew more comfortable with the camera in my new Samsung Galaxy, and for the first time ever, I’m illustrating this blog post with my very own photos. But most of all, I reveled in the intoxicating feeling of being at one with the most exciting city on earth. Help! I’m on Katie Couric’s show next week and I don’t have a thing to wear! Katie in a dress that would never pass her show’s dress code! 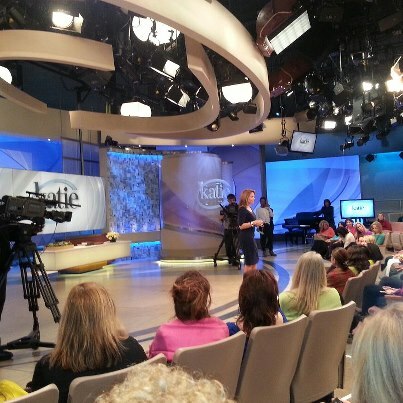 This coming Monday I’ll be in the audience at the Katie Couric show, soaking up the atmosphere for my novel-in-progress, which is set in the land of daytime television. But I don’t have a thing to wear! After the phone call inviting me to attend, they sent me a lengthy e-mail explaining what I should expect and what they’ll expect from me. “Katie loves bright colors!” they said. I should “dress to impress,” with absolutely no black, brown, beige or gray, nothing dark or muted, and no prints. Though I love Duke Ellington’s classic “Black, Brown and Beige,” I don’t cotton to those colors when it comes to my wardrobe unless they’re combined with something brighter. Nor do I usually wear straightforward primary and secondary colors. As an artist, I prefer subtler shades – and lots and lots of prints. But it’s Katie’s show, and she has the right to determine her own esthetic, so I’ll be hitting the January sales this week. I thought I was well past the age of slavishly following someone else’s dress code, so why am I caving for Katie? Because except for a visit to the Conan O’Brien show many years ago, I’ve never set foot in the TV studio of a major network. Even though my novel is pure fantasy, I’m a stickler for accuracy, so I need to do some heavy-duty research. That’s more or less what I wrote in the online application in the section asking why I wanted to attend the show, and maybe it piqued the interest of some lowly intern processing the applications. I didn’t elaborate further, nor will I do so here. I’m so excited about this story, so convinced it’s a high-concept project, as they say in Hollywood, that I’m not about to give away any specifics until it’s up on Kindle. Suffice it to say that it’s my first excursion into the paranormal, and it’s a lot more light-hearted and humorous than Eldercide or Mood Swing: The Bipolar Murders. When inspiration struck last spring, I was slogging away at the sequel to Eldercide, but I was bogged down and blocked. My husband was planning to enter Script Frenzy, an offshoot of National Novel Writing Month, and he suggested I join him. The challenge: to write a 100-page film or TV script during the month of April. But I’ve got no desire whatsoever to write a script. Why not give it a try? What have you got to lose? That whole show-business world is so competitive, I’d never have a chance. Just do it for fun, as a creative exercise (pause as he gazes skyward) I know. What if you write about that show you always watch, and that actor you’re so crazy about? Hmm . . . Maybe that could work. And so I took a flying leap into the unknown – a totally new format, a new genre – and before long I was having a ball. I made my quota of 100 pages in the 30 days of April, submitted my script for verification and printed out my winner’s certificate, but that only took me a third of the way into the story. Then began the challenge of turning it into a novel. I’d hoped my new opus would be finished already, but now I’m aiming for the spring equinox on March 20th. I’m asking you, my readers, to help hold me to that deadline. I’ll post progress reports every week or two, and I hope you’ll leave comments to cheer me on. If I really buckle down, maybe I’ll be free to write another script in April. 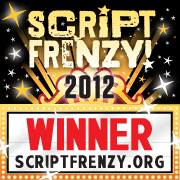 Well before then, I’ll blog about Script Frenzy in hopes of enticing you to join. In the meantime I plan to reconnect with the wonderful online community of writers, and beginning this Valentine’s Day, I’ll be hosting guest bloggers once again. As I wrap up this post, I’m watching the Katie show. Though she doesn’t look it, she’s celebrating her 56th birthday today. And those women in the audience are all decked out in cheerfully brilliant colors. Time to head for the mall – since orange is my favorite color, I’m envisioning something in orange sherbet or tangerine. What colors do you favor for your wardrobe? And how much are you willing to tweak your image for special occasions? New Year’s Resolutions? Bah humbug! January second, and I haven’t made my resolutions yet. with an humongous turd too mushy for doggy bags. and ate the raspberry strudel left from New Year’s brunch. cuddling with my cat Lunesta, named for my favorite sleeping pills. then stole an hour blotting out the news with Spider solitaire. I failed to do last year. trusting in tomorrow, praying for time. I’ve only wasted one more day of life. Last night the famed Caffe Lena in Saratoga Springs (where Bob Dylan, Arlo Guthrie and countless others played on their way up) had its first poetry open mic of the New Year, and having the chance to read this poem there was a major motivator. People seemed to love it – at least they laughed a lot. The Capital Region’s poetry community is a wonderfully welcoming bunch of folks who are always generous with their applause. It’s great to be able to write something, then try it out on stage the same night. How do you feel about New Year’s resolutions? Do you make them, and if so, do they help you work toward your goals? Or do they just make you feel guilty? This cat looks a lot like my beloved Lunesta.